The B.C. Butcher (2016), the fifty-one minute debut feature from then seventeen year old co-writer and director Kansas Bowling (who appears here as one of several on-screen models), operates as a winning homage to the distinctly tongue-in-cheek nature of the American cinema of the 1960’s. Billed as “the first prehistoric slasher”, the labor captures splendidly much of the spirit of the popular American International Pictures’ seven Beach Party movies. This financially stalwart series ran from 1963 to 1965. There is also more than a dash of inspiration derived from the Raquel Welch starring and Don Chaffey directed dinosaurs and ancient humans remake, One Million Years B.C. (1965) Bowling’s attempt also captures the wildly inaccurate nature of the previously stated production terrifically. Much in line with Chaffey’s film, the girls of The B.C. Butcher are visibly wearing lipstick and other forms of make-up. These details are spectacularly done. They arrive courtesy of Jason Adcock. He is also credited with summoning the appearance of the flick’s monster. The creature himself, played admirably by Dwayne Johnson, is smirk-inducing. This is in its uncanny similarity to Leatherface from Tobe Hooper’s timeless horror classic The Texas Chain Saw Massacre (1974). Continuing the above stated comparison, the females of The B.C. Butcher are adorned in what can best be described as “Paleolithic chic”. This is a mixture of what we have come to expect of antediluvian dress with a semi-modern sensibility. Not only does this summon to the psyche the aspects mentioned earlier, but also makes one think of Michael Chapman’s failed adaption of Jean M. Auel’s novel, Clan of the Cave Bear (1986). This only adds to the heavy nostalgia Bowling’s opus elicits. As can be expected from the originally addressed parallel, we are lent an exuberantly cheery, decade appropriate opening title arrangement. It is beautifully orchestrated. Moreover, it uses the pleasant din of “Alley Oop”, performed by the Hollywood Argyles and penned by D. Frazier, as a wonderful modus of setting the campy and largely old-fashioned tone of the entire composition. True to form, there is also an unexpected musical performance. As is often the case with such interludes, it adds nothing to the story. Yet, it still far accelerates the fun factor of the material. With The B.C. Butcher, this comes shortly into the third act. It is a performance of the catchy track “Nobody Likes You” by The Ugly Kids (authored by A. Tijeria). Complete with watermelons mechanizing as guitars and drums, this is just like a concert item one might see from a live-action visualization of The Flintstones (1960-66). Such makes the results of this energetic, several minute depiction all the more inventive and highly endearing. What could’ve easily been filler comes off as one of the more memorable passages in the affair. Keeping true to its obvious inspiration, the gore is, with the exception of an originating section where the main ladies of the tale are seen eating innards, nearly non-existent. For fellow Troma Entertainment fanatics this may come as a letdown. The unimaginatively executed deaths we spy here may evoke an analogous sense of disappointment. This is excluding an intentionally hilarious skit involving a woman being thrown into a hole. Such is juxtaposed with alternating shots of both a real and faux snake attacking the individual. But Bowling, who shows incredible behind the camera flare (especially considering her age), and executive producer Lloyd Kaufman know exactly what they are doing. These aforesaid faults still follow the notion of what one may logically see in a construction from fifty years ago. Such is especially true in the conception, effects, pace and general veneer of Bowling’s narrative. In turn, the undertaking comes off as both a knowing and ardent letter to a bygone era. It is one constructed, and made all the more intriguing, by its slight modern touches. Despite the initial shortcomings, these traits endure as a mirror of the obvious inspirations for The B.C. Butcher. Just as charmingly, Bowling has issued an enterprise that noticeably incorporates the hallmarks of a Troma epic. This is most evident in the dialogue and performances. All of which are delivered with an ‘in on the joke’ B-show wit. These qualities are also visible in one of the most victoriously humorous sequences herein. It is a flashback to the relationship between Rex (in a strong, appropriate for the material enactment by Kato Kailin where the above attributes certainly apply) and the heroine of our tale, Neandra (in a heroic yet, vulnerable turn from Leilani Fideler that is phenomenal. It is uniquely well-rounded and wholly watchable). This particular moment comes at about fifteen minutes in. It works so well because of how the whole segment operates as one successful parody of such stereotypically overdone instances usually found in film. Kailin’s depiction here, which makes all the lines he is handed come off like a rambling stand-up comic in the most effective manner possible, is what makes this strangely well-executed bit so successful. It’s intriguing, to say the least, notion of romance is equally guffaw-inducing. The laugh factor here is almost duplicated in a montage. It utilizes narrator Kadeem Hardison’s smooth narration as ambiance to create a gleeful opening scene. Such is one which cleverly comes off like a shakily recorded, though this may be intentional, trailer for the photoplay we are about to view. 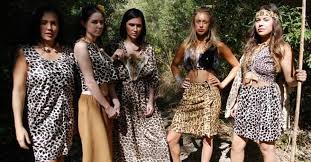 Bowling, along with fellow screenwriter Kenzie Givens, chronicles Neandra’s management of a tribe of cavewomen. These include the blind prophetess Bamba (Devyn Leah), Poppy (Molly Elizabeth Ring) and Anaconda (Natasha Halevi). As you can tell, some of the slyest gags in the composition arise from a lot of of the characters’ names. After a within community sacrifice, the title fiend begins to pick of Neandra’s clan one by one. Ignoring Bamba’s prophecies of impending doom, the collective finds themselves forced into an attempt to unravel the mystery of those who have gone missing. Eventually Neandra and the angry, murderous and correspondingly despairing cave-dwelling giant, who has been thinning out Neandra’s followers, find themselves facing off against one another. Yet, their parallels to one another run deeper than they may ever know. It is a plot that is admittedly sparse, but has never feels that way. Moreover, it takes the largely replicated Halloween (1978) and Friday the 13th (1980)-like psycho on the loose elements, so often recycled, and incorporates them in a time and location never before seen. Such makes these well-worn components feel refreshingly new. The proficient script by Bowling and Givens is smarter than may be immediately perceptible. It is also well-structured and endlessly amusing. Tomoaki Iwakura, Aaron Meister and Richard Samuels provides sleek, vibrant and alluring cinematography. Robby DeFrain’s editing is brilliant. William Preston Bowling, Nathan Lowe and Joel Steven administer sharp displays of sound. Florent Clavel’s music department contribution helps elevate the entirety. This is with a mixture of pop and rock tunes which embody the upbeat essence of the exertion deftly. The soundtrack here is the perfect ambiance to the visuals Bowling and company have crafted. Additionally, the rest of the cast, with Miranda Robin as Dina and Rodney Bigenheimer as himself, are as cheerily active as the depictions of the leads. Though Bowling lingers too long on the search for the individuals who have disappeared, the piece as a whole is undeniably, consistently impressive. The finale is fitting, but wonderfully underplayed. It represents another extension of remarkable ability for Bowling’s endeavor to turn dramatic tropes into comic gold. This item mechanizes incredibly well to the benefit of the product as a whole. Yet, Bowling’s immense talent, visible in her accomplished and stylish direction and literary participation unveiled within, is undeniable. This factor is illuminated in every winning wink at the audience her luminous composition exudes. It is further exposed in every purely enjoyable frame in this delightful, gleefully low-budget popcorn venture. Bowling assuredly has a bright future ahead of her. The B.C. Butcher, complimented in various means by its brief length, is many cuts above the genre competition.